A projector's aspect ratio refers to the ratio between its width and height. For example, a 4:3 display produces an image that is more square, where a 16:9 ratio produces an image that is more rectangular in shape. 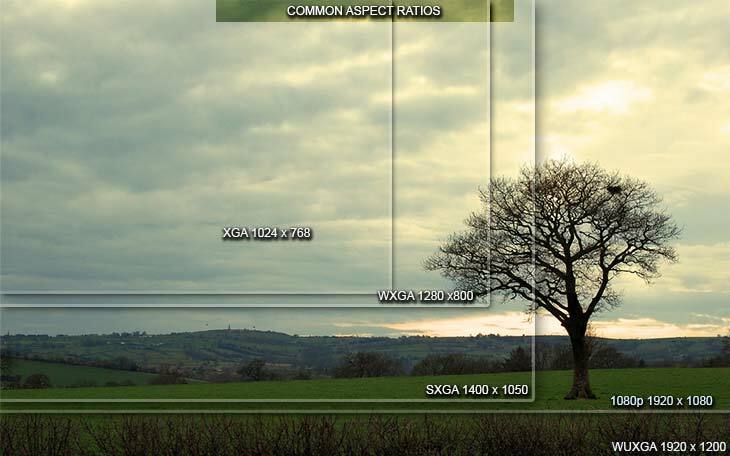 The three most common video projector aspect ratios are 4:3 (XGA & SXGA), 16:10 (WXGA & WUXGA) and 16:9 (standard HDTV, 1080p). Which is best for you? It depends what you plan to project. As always, your best bet is to match your projector's aspect ratio with that of your source. Most people who use their projectors for presentations will find a 4:3 aspect ratio does the trick. However, the computer display industry has been moving away from the 4:3 format in recent years. If your laptop has a widescreen display, a video projector with 16:9 or 16:10 resolution capabilities would likely be a better choice. It is worth noting that most 16:10 or 16:9 native aspect ratio projectors are capable of displaying 4:3 aspect ratios	without	any	issues at all. We know this can be a bit confusing and we'd love the opportunity to answer any questions you might have. If you have a question about this, just give us a call at 1-888-248-0675 or start an online chat with one of our experienced reps.
16:9 is the standard aspect ratio of Blu-ray discs and HDTV signals. It is the only widescreen aspect ratio natively supported by the DVD. Most home theater projectors employ this aspect ratio. Can I watch 4:3 content on a 16:9 display or 16:9 content on a 16:10 display? Sure! However, you will see black bars on the top and bottom or along the sides of your image when viewing material that does not match the native resolution of your projector. Ready to upgrade your home theater? Check out all of our current sales and promotions by clicking here, or find your perfect projector by application here. Have questions or need assistance? Our experts have worked in the AV business for more than 15 years and are available to answer any questions you might have. Give us a call at 1-888-248-0675 or chat with us online today!